Our production site is located in Bernsdorf / Strassgraebchen, close to the city of Kamenz. Coming from Berlin or Northern Germany, please use highway A13, from all other directions, please use highway A4. 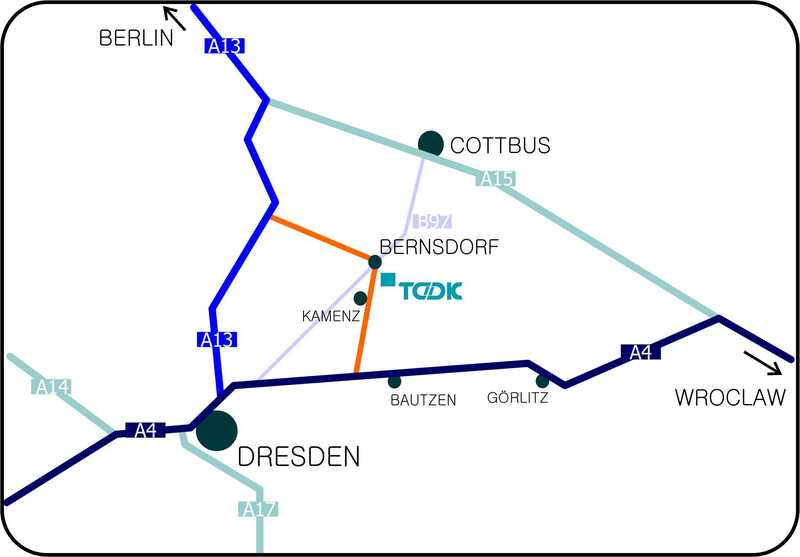 Use the highway A13 towards Dresden, go past the junction “Dreieck Spreewald” and stay on the A13. Leave the highway at Ruhland interchange and turn left onto the route B169. Turn right at the next traffic lights and follow the main road to Bernsdorf. At the traffic lights with the town, turn right onto route B97. After the next traffic light, turn left (follow the signs to Kamenz). Follow the road through the village until you see “Holz-Kunze Gmbh” (wood retailing) on the right side. Turn left and head straight towards the large plant buildings. Leave the highway A4 at Burkau interchange and turn right onto route S94 towards Kamenz / Hoyerswerda. Follow the road and go past Kamenz (go straight over the traffic lights) and past the turn-off to Strassgraebchen. After the bridge over the lower fields, our plant site is on your right side.